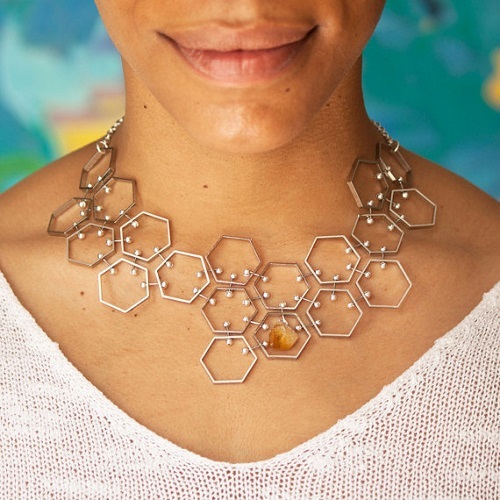 I stumbled upon the hexagonal jewelry of Bethany Gomes of Los Angeles in quite a roundabout fashion! My husband had forwarded me a photo of her unique modern style which her boyfriend had shared on Reddit. Fortunately he had remembered to share her shop name - Anomaly Assembly - which I could then locate on Etsy! 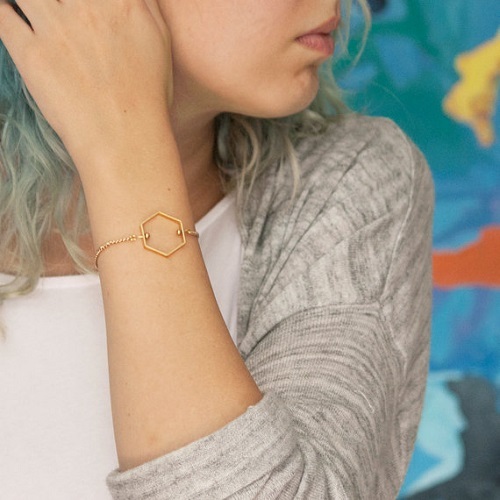 Focusing on just one element, the hexagon, unifies all her designs in her store. 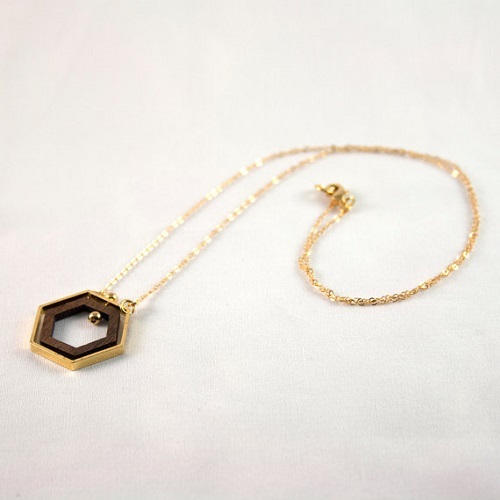 She drills holes in the metal hexagons and connects them with wire "barbells". I also have to admit, the hexagons remind me of benzene rings having spent years having to draw those chemical structures! 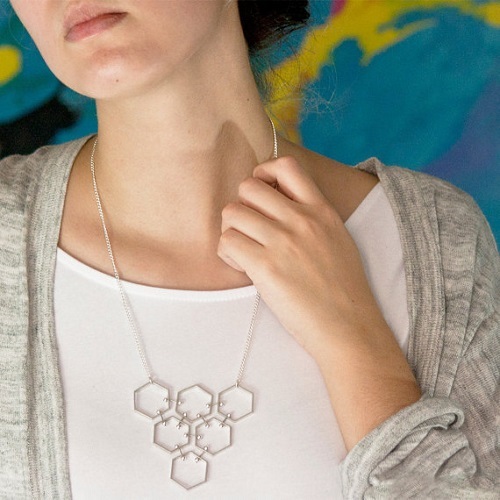 Lovely designs for those who love minimalist looks or are chemistry orientated! By day, Bethany is an architectural intern. She explains, "Working in the architectural field, projects take months and even years to be built and are often put on hold indefinitely. I started Anomaly Assembly to fulfill my creative impulses more immediately." We all so understand instant gratification, Bethany! Bethany added, "I'm incredibly lucky to have a boyfriend that believes in me enough to brag about me on the internet. He also helps me make the jewelry and takes photos for me when I can't get someone else to model." What more could you ask for a supportive significant other! Focusing on one design certainly enables the creator to go many places with that design. It seems that anyone who does gets hit with the inspiration stick and comes up with incredible ideas! Love the look of Bethany's creations. 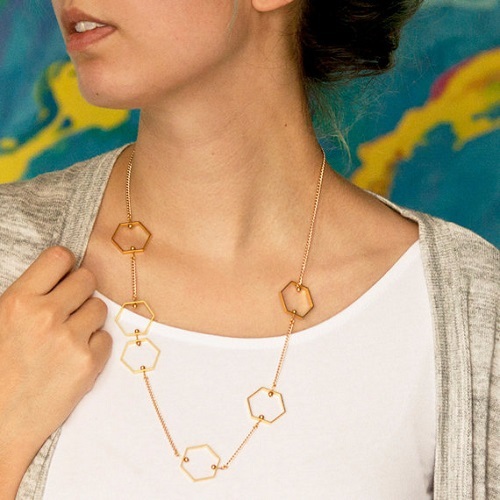 To me they look like honeycombs and I do love honey! Honeycombs do come to mind! I like how she used that shape to unify her collection! Organic chemistry is "prettier" with all the cool structures,eh?